Currently are many 3D/S3D formats out there, the most common ones are side-by-side and above-below (also called top-bottom) for stereoscopic displays like 3D-TVs/Displays from Samsung or Sony with shutter- or polarisation-glasses. Row- and column-interleaved for autostereoscopic displays like the Nintento 3DS- or the Fuji FinePix W3-display.And anaglyph 3D viewed through glasses with two-color lens (with chromatically opposite colors like red/cyan or green/magenta) to create a 3D effect. Anaglyph 3D can be viewed on all display types, special 3D hardware is not needed. Below you will find an overview about the 3d formats used on dreamscene.org with detailed information about compatible devices and usage. This format offers the possibility to store full images without loss. 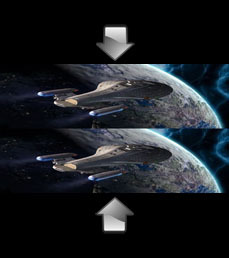 A full-HD 3D-frame (1920x1080) will result in 3840x1080 pixel to store the left and right eye images in a single frame horizontally (left eye image on the left side, right eye image on the right). For use with: NVIDIA 3D Vision + 3D Monitor. Compatible to: Stereoscopic Player, select 3D format [L][R]. Tested on: NVIDIA 3D Vision (9600GT) and Samsung SyncMaster 2233RZ. The halfsize format works by halving the horizontal resolution of each image to store left and right eye images in one single frame. For instance, a 1080p frame (1920x1080) will actually contain a 960x1080 pixel frame for the left eye and a corresponding frame for the right eye. For use with: e.g. Samsung or Sony 3D TVs, select 3D-Mode [L][R]. Compatible to: also works with NVIDIA 3D Vision Kit. Tested on: Samsung LE40C750 3D TV with shutter glasses. 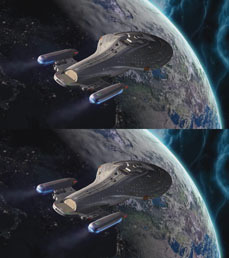 The above-below format also stores full images without loss in a single 3D frame. A full-HD 3D-frame (1920x1080) will result in 1920x2160 pixel to store the left and right eye images in one frame vertically. For use with: 3D devices + pol glasses, like some Acer Notebooks and Zalman 3D Monitors. Compatible to: TriDef Player. Tested on: Acer aspire 5740 DG Notebook with polarisation glasses. This format works by halving the vertical resolution of each image to store left and right eye images in one single frame. For instance, a 1080p frame (1920x1080) will actually contain a 1920x540 pixel frame for the left eye and a corresponding frame for the right eye. This format is also used on Sony's PS3. The row-interleaved format works by halving the vertical resolution of each image to store the left and the right eye images in a single frame, line by line. For use with: 3D devices + polarisation glasses like iZ3D or Zalman displays. Compatible to: e.g. TriDef, Stereoscopic Player. Tested on: Aspire 5740 DG Notebook with polarisation glasses. This interleaving format works by halving the horizontal resolution of each image to store the left and the right eye images in a single frame, column by column. For use with: autostereoscopic 3D displays (without glasses). Compatible to: upcoming 3D monitor and TV devices. Tested on: - format not tested yet. Anaglyph 3D videos are viewed with two-color lens glasses (normally with chromatically opposite colors like red-cyan or green-magenta). To create the 3D effect, the final images are made of two superimposed color layers. 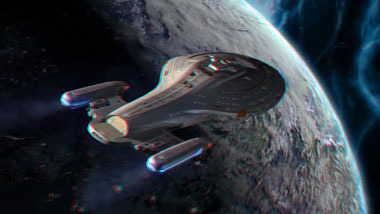 For use with: Two-color anaglyph 3D glasses, red-cyan or green-magenta. Compatible to: nearly all display types and players. Tested on: several std. 2D monitors and TVs. In addition to the above listed 3D formats, native Blu ray 3D supports full 1080p content at source. The images intended for the left and right eye are already at 1920 x 1080 pixel resolution. These images are then displayed in a usual field sequential order to render the effect of a 3-dimensional image. Tested with Sony BDP-S470 3D Blu-ray player.